A strange telepathic message prompts the Doctor to travel to the ‘Sector of Forgotten Souls’, a place where, thousands of years ago, Omega’s ship vanished whilst detonating a star. He’s not the only one journeying towards it. ‘Jolly Chronolidays’ prides itself on giving its tourists an experience of galactic history that is far better than mere time travel. Its motto is ‘We don’t go into history, we prefer to bring history to you’. When Omega’s ship suddenly materialises in front of their shuttle, and one of their employees goes insane and tries to destroy his hands, suddenly it’s not just a motto anymore. And Omega – and his madness – is closer than they think. 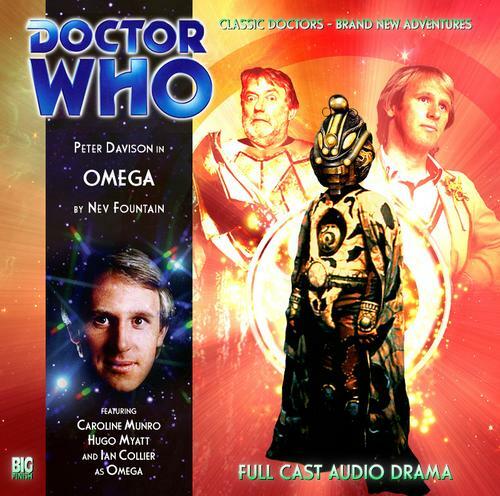 Peter Davison is the Doctor in…Omega. A hero is only as good as their villains. Captain America has the Red Skull. Will Graham has Hannibal Lecter. The Flash has the Rogues. Sherlock Holmes has Moriarity. The WWE Universe has Triple H. And the Doctor has…Omega? 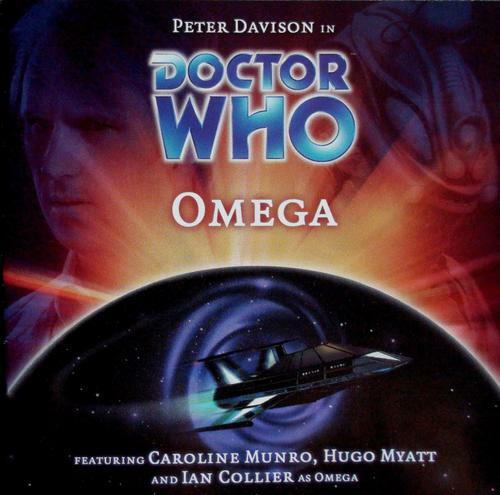 Omega is the first of Big Finish’s “Villains” trilogy, focusing on the title character of Omega, who previously appeared in the Third Doctor story The Three Doctors and the Fifth Doctor serial Arc of Infinity. This time, Omega once again finds his fate intertwined with that of Peter Davison’s Doctor. Starting out as a murder mystery before evolving into a character study, Omega enjoys strong performances from its two leads and supporting cast, but fails to take advantage of a stunning third-act cliffhanger and stumbles during its final act, crossing the finish line with an incredibly unlikely conclusion. In the future, why take a holiday through history when someone can bring the history to you? A star shuttle for the temporal travel agency Jolly Chronolidays is docking with the Omega Heritage Center in the far-flung Sector of Forgotten Souls. It was here, thousands of years ago, where Omega, the great Time Lord scientist, attempted to explode a star and use the resulting supernova to take control of history. His experiment failed due to sabotage by his assistant, Vandekirian, and Omega and the crew of his ship, the Eurydice, to be sucked into the resulting black hole. The Gallifreyans mourned his passing, revering Omega as a great hero and successfully completing his experiment upon three other stars. The resulting power enable them to travel through time, and thus were born the Time Lords. Jolly Cronolidays allows its patrons to relive the final moments of Omega’s life, from the betrayal of his assistant all the way through the final destruction of the Eurydice and Omega’s death, reenacted by a troupe of the galaxy’s finest actors, a troupe that included Daland, best known for his performance as a preacher in the daytime serial Hearts in Orbit. And if they’re lucky, they might even experience the return of the Eurydice to our universe, an event that happens once every hundred years! But as a certain fair-haired, pleasant-faced young man on the shuttle knows, Omega did not die. He was transported to another universe, a universe of anti-matter, where he grew bitter as he realized that the Time Lords had abandoned him. His previous attempts to return to our universe and taken revenge upon the Time Lords were both thwarted, first by the First, Second, and Third Doctors, and then by the Fifth Doctor during an encounter in Amsterdam. But what if the legend is true, and Omega, who has twice escaped the anti-matter universe only to be defeated and flung back, and the Eurydice are truly set to return? Omega, the main character of this serial opposite the Doctor, is a character that occupies a critical point in Time Lord history and thus the overall lore of Doctor Who, but has only been formally and canonically introduced in two television serials, the last of which aired almost twenty years before the release of Omega. Davros and the Master are easy choices when it comes to picking villains to act as the centerpiece of a story, but Omega is an interesting pick for Big Finish to make. To me, Omega is very much like Hank Henshaw/Cyborg Superman. Superman has his archenemies; Lex Luthor, General Zod, and Doomsday. While those three villains can easily be named by even those who don’t follow comic books, Henshaw has played a vital, but lesser known role in the Superman mythos; a foe that Superman has faced time and time again, and one who played a major role in the “Death and Return of Superman” arc in the early 90’s before branching out and becoming a villain to the DC Universe at large. A villain who played a large part on one of the most memorable and mainstream comic storylines of all time, but also one who might not even make the top five villains in a poll of Superman fans. Omega fits the same mold as Henshaw; the power of the Time Lords to travel through time and take control of history can be traced back to Rassillon and Omega, and various McGuffins have been named after Omega in several Who serials. But Omega would be hard pressed to make a “Who’s Who” of Who villains, even among the most dedicated of fans. In his previous appearances, Omega was a vengeful Time Lord who ranted and raved about his place in history, and was willing to do whatever it took to return to our universe to take revenge upon those who wronged him. He came off in those stories as a villain with a legitimate greivence, but his over-the-top rantings and ravings made him come off as nothing more than a bad guy with a victim complex who cared only for the accolades he felt he deserved. 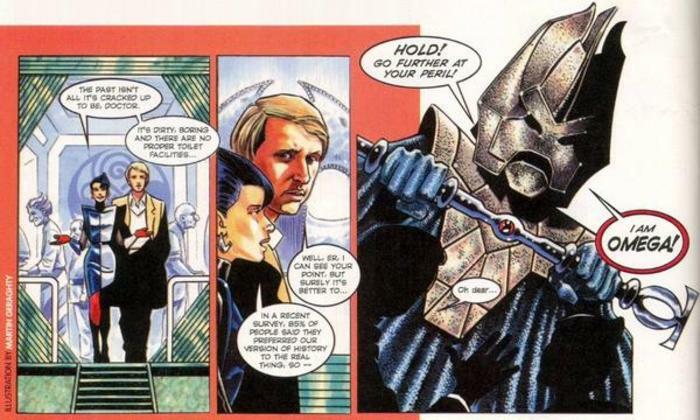 As such, writer Nev Fountain (who also penned the much loved Fifth Doctor audio The Kingmaker) has a unique opportunity with this serial to define Omega for a new audience and really elevate his place in the villain pantheon. Fountain has his work cut out for him, however. Up to this point in the release schedule, Big Finish’s stories have avoided the need for a listener to be familiar with specific episodes or characters from the television series. Even the audio Primeval, which served as both a sequel and a prequel to the TV serial The Keeper of Traken, was accessible to a listener who had never seen the episode. Fountain manages to keep this concept alive, laying out Omega’s backstory in the very first episode, using the acting troupe employed up the travel agency to inform the listener of the parts of Omega’s story that are pertinent to the serial. Any additional information about Omega is revealed as the story progresses, either by Omega himself or the secondary characters interacting with him. The only time a listener might go “huh?” actually comes when Omega and the Doctor mention the events that took place in Amsterdam during Arc of Infinity regarding bio-printing and Omega’s survival of their struggle. But the key point is still made during the conversation, and the confusion is soon forgotten as the story progresses. As the title character, Omega is the lynchpin of the entire story; the success of the story falls squarely on the performer’s shoulders. Ian Collier returns to the role of Omega after portraying the Time Lord in Arc of Infinity. Whereas Collier was weighed down with technobabble and a sense of overzealous vengeance in that serial, in this story the techobabble is kept to a minimum (see my earlier comments about bio-printing), allowing him a chance to portray a character searching for an identity. Omega wanted glory and accolades, as made clear throughout several scenes taken from earlier in Omega’s life, but in a universe that has nothing for him and cares little for him, Omega simply wants to return to the anti-matter universe he had escaped from. For at least there, he had some measure of power and respect. Omega spends a good bit of Omega inquiring what the universe thinks of him, specifically asking the Doctor how the Time Lords remember him. When the Doctor tells him that he’s remembered as a legend, whereas Rassillon is remembered as THE Time Lord…Collier manages to convey a range of emotions throughout the story. He knows how he wants to be remembered, and when he realizes he never will be remember that way, Omega just wants out. Collier, of course, has his over-the-top moments when Omega’s rage and envy pour out, but the listener can hear how he’s trying to keep his emotions in check. But in the end, he still wanted to return home and damn anyone who gets in his way. Fountain and Collier work to make Omega a sympathetic villain, but a villain nonetheless. Opposite Ian Collier once again is Peter Davison, this time sans companions. Without Nyssa or Tegan at his side, Davison can play the Doctor as is, without worrying about what his friends do or say or dealing with the trouble that they enventully find themselves in. A good part of the story involves the Doctor and Omega squaring off, first as enemies, and then as reluctant allies as the Doctor attempts to assist Omega in returning to the anti-matter universe before realizing just what such travel would entail. This is the Fifth Doctor in his natural element; eager to help, quiet until provoked, and always with a witty comment or insightful observation. Davison and Collier enjoy a chemistry that allows them to engage in both quiet conversation and shouting matches; not quite friends, but two people who, in another time and place could have been friends. Davison exudes this confidence with the rest of the cast as well, doing what the Doctor always does; taking charge and putting himself in the middle of things without anyone even noticing that he’s doing so. The same happens near the climax of the story. As the Doctor is confronted with a history of some of the horrible things that have happened in his wake (consider serials such as Warriors of the Deep or the audio Creatures of Beauty), Davison doesn’t just throw angst into his performance and call it a day. Rather, the Doctor admits what has happened, but refuses to let it weigh on his actions. Davison plays it as the Doctor as a victim of circumstance while trying to do the right thing, as opposed to letting it beat him down and burn him out. The music is of a lower key than in previous serials, focusing more on sound effects and taking advantage of the audio format. Omega’s voice is spot-on, just off-kilter enough to remind a listener that he’s not from this universe anymore, and the vast emptiness of the Eurydice is portrayed in an eerie, off-putting manner. There’s also a great spot where, in the gift shop, a collection of Omega talking action figures is knocked over and repeats four simple phrases over and over again. But the highlight is the presence of the Scintillans, whispers in the dark who constantly hound the unwilling passengers of the Eurydice, demanding justice for the genocide Omega committed upon them when he exploded their solar system’s star. The whispers and the scratches are done in a much better manner than they were in an earlier audio, Embrace the Darkness, drifting in the background until they emerge to torment a character instead of dominating the scene and assaulting a listener’s ears. The direction, however…the problems I have with the direction tends to go hand-in-hand with the problems I had with the script. Whereas Omega is a being in search of an identity, Omega is a serial in search of an identity. The story starts off as a murder mystery, but the listener will easily pick up the perpetrator early on which takes some of the suspense out of it…until the third episode cliffhanger occurs, and knocks the listener for a loop. Anyone who’s seen Arc of Inifinity won’t be too surprised and have more of a “ah, that makes perfect sense” reaction, but those who haven’t are treated to one of the best Big Finish cliffhangers, up there with the second episode cliffhanger in Dust Breeding or the third act’s climax in The Chimes of Midnight. Up to that point in the story, director Gary Russell and Nev Fountain have crafted a decent, if somewhat predictable, murder mystery story where the listener is damn sure they know who the killer is and who’s behind these shenanigans, sprinkled in with dry dialogue and moments of tension breaking humor and a dash of over-the-top acting thrown in for good measure. But in the fourth episode, everything gets thrown away. Omega turns from a tension-filled affair into a redemption story out of the proverbial blue. One moment, the threat of getting hauled to the anti-matter universe has everyone on their toes. The next, a story is being laid out that paints Omega in a more positive light and the Doctor in a decidedly more negative one. It’s a jarring switch in tone as Fountain attempts to play the “both sides of the same coin” card, where Omega turns out to not be such a bad guy and the Doctor’s flaws are played up and put on display. This switch could have been done much better if it didn’t come off as incredibly hand-handed, to the point where the fourth episode didn’t feel so much like “Omega’s redemption” so much as “Omega fix fic.” Sure, sometimes even Lex Luthor cuts a check to charity, but Fountain’s writing makes it seem like the Time Lord who blew up a star, got tossed into an anti-matter universe, and TWICE tried to destroy the Time Lords out of petty revenge is nothing more than a victim of circumstance, while the Doctor, Champion of Time and defender of all that is good, is responsible for more death and destruction than anyone else in the universe. Instead of striking a balance, Fountain goes for the extremes, and a chance to paint Omega as a sympathetic villain is instead turned into a chance to paint the Doctor as the true villain. While the Doctor, especially the Fifth, is surrounded by death and destruction at every turn, Omega takes the concept too far, and in the end, especially the very last scene, the whole thing is actually turned into one big cosmic joke where the events and questions raised in the fourth episode are completely handwaved away, and a serial about one of the most influential villains in Time Lord history becomes little more than a story about just how non-Doctor the Doctor truly is. Synopsis – 3/4th’s of a good story about one of the Doctor’s lesser known but important villains makes a 90 degree turn, and Omega loses its way and a chance to place its stamp upon the title character. 3/5. Colin Baker is the Doctor in Davros. This entry was posted in Big Finish Review and tagged 3/5, Big Finish, Doctor Who, Fifth Doctor, Omega, Peter Davison, TARDIS. Bookmark the permalink.